Who among us hasn't dreamed about being Commissioner Gordon? Just think, you could live in the most dangerous city in the country. You could constantly be kidnapped by super-villains, constantly apologizing to the people of Gotham for not catching the latest serial killer. And when pressed to actually do your job you could just flip on the Bat-Signal and let a weird guy in a costume handle the tricky parts. Well dream no more, my friend. 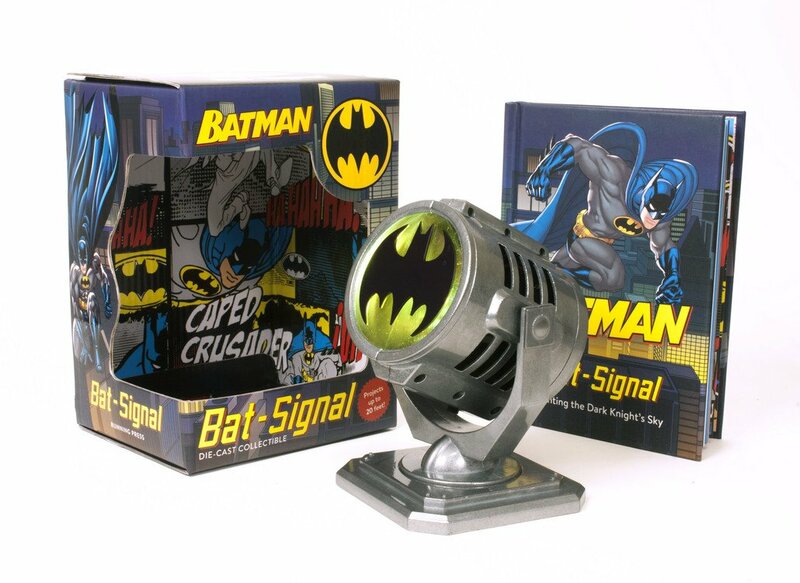 Now, you too can light up your bedroom wall with a die-cast Bat-Signal from Running Press. With it, you can pretend to summon Batman and then get annoyed at him for disappearing on you in mid-sentence. As the proud owner of over five Bat-Signal replica toys (hey you spend your money your way, I'll spend my money my way), this newly released five-inch tall monster is easily the most durable of them all, and even projects the brightest bat-logo. But the signal is only half the fun. Included with this replica is my latest book, Batman: Bat-Signal: Lighting the Dark Knight's Sky. This small hardcover tells the entire history of the famous overgrown nightlight, from its first appearance all the way to some of its most recent uses. The only thing not included in the book is the time Hitman killed a cat and placed it on a searchlight in order to summon Catwoman. Because unlike the writer of this blog, the people at Running Press have good taste. Oh well. Just print this part out and paste it in the back.